The annual National FFA Convention & Expo draws more than 56,000 FFA members, alumni, teachers, school administrators and agriculture industry representatives from throughout the country. The four-day event, which moves to Louisville, Ky., this year through 2015, is one of the largest student gatherings in the nation and has been an annual event for FFA since 1928, the year the organization was founded. The annual National FFA Convention & Expo is one of the fastest-growing expo events in the country, according to Expo Magazine. In recognition of its rapid growth in size, attendance and exhibit space, the National FFA Convention & Expo has been named one of the top-growing expo events in the country by Expo Magazine. More than 400 companies exhibit at the annual National FFA Convention & Expo. At the three-day Expo, FFA members are able to meet company representatives, learn about their operations and get answers to their questions about companies and their roles in the agriculture industry. Many large corporations exhibit at the event, including Ford, John Deere, the U.S. Army, Dodge, Monsanto, Toyota, Case IH and more. From 2011-12, the Expo’s square footage of exhibitor space grew by 14 percent as did overall revenue from the sale of exhibit space. 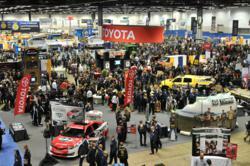 Attendance grew also, rising from 53,000 attendees in 2011 to more than 56,300 last year. This year’s Expo will span more than 290,000 square feet of space inside Kentucky Exposition Center in Louisville. The top five fastest-growing shows in 2012, according to Expo Magazine, were the International Consumer Electronics Association, 2012 Institute of Food Technologists Annual Meeting & Food Expo, Chicago Comic & Entertainment Expo, Couture and Coverings 2012. Others making the top 25 were the Global Petroleum Show , National Restaurant Association Restaurant, New York Comic Con, the National Rifle Association’s Annual Meeting and Exhibits and the World Dairy Expo. The National FFA Organization will be honored with an Excite award at the 2013 Excite Awards Luncheon June 19 at the Baltimore Marriott Waterfront in Baltimore, Md. The luncheon precedes the 2013 ExpoNet, a two-day gathering of show organizers and their teams led by leading expo companies and show professionals. The National FFA Organization provides leadership, personal growth and career success training through agricultural education to 557,318 student members in grades seven through 12 who belong to one of 7,498 local FFA chapters throughout the U.S., Puerto Rico and the Virgin Islands.